Children should be given many opportunities to work with concrete examples (hands on manipulatives) before moving on to more abstract concepts. 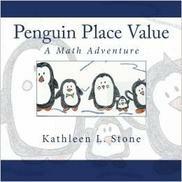 You will find several enrichment activities at the end of Penguin Place Value. Click here for additional activities and resources. At the end of Riley the Robot there are numerous enrichment activities to provide children extra practice identifying the “rule” for various problems. You may also find additional activities and resources by clicking here. Enrichment activities and resources can be found at the end of Number Line Fun and by clicking here. Additional enrichment activities and resources can be found at the end of the book and by clicking ﻿here﻿. Additional enrichment activities can be found at the end of the book and by clicking ﻿here﻿. "There's someone I'd like you to meet down at the Elma Zoo. She's a great mathematician named Kenly the Kangaroo. Along with Kenley, children will create a line plot graph of all the friendly feet they see at the zoo. Through the interactive text and engaging illustrations, children will be given opportunities to organize and interpret data on Kenley's (and their) line plots. Activities and topics are included at the end of the book to provide additional enrichment opportunities. You will definitely want to add this book to your library. It is an excellent way to integrate literacy into your math curriculum as you introduce, review, and/or reteach this important math skill. "Matthew the chef loves to bake cookies, candies, pies and cakes." Come join Matthew on his baking adventure and learn all about arrays. An array is an arrangement of objects, pictures, or numbers in columns and rows. Arrays are useful representations of repeated addition and multiplication equations. Additional enrichment activities and resources can be found at the end of the book by clicking here. “Firefighter Gary came to our school to talk to our class about fire safety rules.” Join our class as Firefighter Gary shares with us how to prevent fires and what to do in case of a fire. Enrichment activities and resources can be found at the end of Firefighter Gary's Fire Safety Rules and by clicking here. Enrichment activities and resources can be found at the end of Grandma's Quilts and by clicking here. Learning about 3D shapes is a great opportunity for a variety of hands-on activities. A great place to begin is by looking at real life examples of 3D shapes. As you discuss 3D shapes and their attributes it is important to use the actual names of each shape (i.e. cube rather than box) as well as other key vocabulary words including surface, curved, flat, face, corner, vertex, vertices, and edge. Enrichment activities and resources can be found at the end of Samantha's Search and by clicking here. “More Penguin Place Value” is a sequel to the popular children’s book, “Penguin Place Value.” This delightful book provides opportunities for children to practice their place value skills with hundreds, tens, and ones. They will also be introduced to expanded notation form and number words. Children will enjoy reading the further adventures of this cute penguin family that they were introduced to in “Penguin Place Value.” The rhythmical text and charming illustrations, along with the interactive nature of the story, will keep young learners engaged. Suggested learning activities, included at the end of the book, provide further practice of this important skill..
Enrichment activities and resources can be found at the end of More Penguin Place Value and by clicking here. Enrichment activities and resources can be found at the end of Daniel's Day of Multiplication and by clicking here. Do you remember the rhyme Hickory Dickory Dock and the cute little mouse who went up the clock? Well she’s back to help children learn how to tell time. Children will enjoy learning to tell time to the hour and the half-hour as the little mouse takes them around to some of her favorite clocks. At the end of the book you will find additional activities that you can do to enrich their telling time skills. You may also click here for additional resources.